Hunts’ hopes of advancing to the regional finals of the Balcomb Trophy, the men’s inter-county double rink championship, were dashed by Suffolk who were convincing 41-22 winners at Parkway. Both Hunts rinks were beaten, Simon Leader, Simon Law, Mike Robertson and Tristan Morton lost 9-17, while Rob and Ed Elmore, Lewis Baker and Nicky Brett went down 13-24. Hunts will be hoping the under 25s can make progress to the national finals on Sunday when they compete in the regional finals of the White Rose Trophy at Whittlesey Manor (10am). They face local rivals Cambridgeshire in one semi-final, with Essex and Herts clashing in the other. Hunts resume their Middleton Cup inter-county championship programme on Saturday when they entertain Bedfordshire at Parkway. Having lost away to Cambridgeshire in their opening match, Hunts will be hoping to register a success to keep alive any chance of reaching the quarter-finals. Hunts: Paul Dalliday (Whittlesey Manor), Joe Randall (Parkway), Robbie Coleman (Brampton), Tristan Morton (Parkway); Richard Wilson (Hemingford), Lindsay Swannel (Warboys), James Price (Brampton), Lewis Baker (Warboys); Brian Martin (Parkway), Scott Wilson (Hemingford), James Harford, Mike Robertson (both Parkway); Eric Baker (Papworth), Trevor Collins, Simon Law, Ean Morton (all Parkway); Simon Leader, Rob Elmore (both Warboys), Ryan O’Flanagan (Brampton), Ed Elmore (Warboys); Steve Farrant, Harry Ward (both Warboys), Owen Kennedy (Hemingford), Nicky Brett (Warboys). Despite having to issue an appeal for two more players earlier in the week to complete squad, the Hunts women’s team put up another determined display in their Johns Trophy match away to Norfolk on Saturday. They shared rink honours at three apiece, which means they have won seven of the 12 rinks played so far in two matches, but unfortunately, as with the opening match against Northants, they lost overall. There were rink wins for Val Corn, Julie Masters and Dina Barlow, but their accumulated profit was unable to counteract the defeats for Sheila Craig, Joan Padley and Judy Ford. Hunts 100 (6), Norfolk 121 (16) – (Northants skips only): Val Corn won 21-18; Julie Masters won 21-11; Joan Padley lost 14-24; Sheila Craig lost 12-33; Judy Ford lost 10-21; Dina Barlow won 22-14. The latest Hunts qualifiers for the Bowls England national championships at Leamington in August are Michelle Barlow (Parkway) and Juliet May (Buckden), the defending county champion, who came through the two-bowl singles play-downs at Parkway on Sunday. 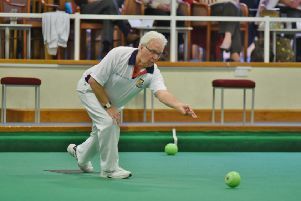 The Hunts men’s four-bowl singles competition got under way last week with a whole host of preliminary round walkovers. Only seven of the 21 scheduled fixtures actually made it to the green, including a 21-20 victory for Tristan Morton over Parkway colleague Trevor Collins, but the former international was beaten 12-21 in the next round by his Middleton Cup lead Paul Dalliday (Whittlesey Town).